Public cofounders Kathleen Brandt, Brian Lonsway, and I mourn with heavy hearts the passing of our very dear colleague and Imagining America National Advisory Board member Randy Martin. A dancer and a scholar, with a warm spirit and an incisive mind, an idealist and an activist, it was Randy who suggested that Imagining America create “collaboratories” in order to generate participatory initiatives, one of which led to the creation of this journal. Very dear Randy, you will be deeply missed. Turning to other acknowledgements, we take this opportunity to thank Eric Spina, who stepped down as Provost and Associate Chancellor of Syracuse University (SU) at the end of 2014, having served in that position since 2004. Eric offered Public its first institutional home at SU. We are grateful for his enthusiasm regarding Public and wish him well in future endeavors. We are equally grateful to Kal Alston, stepping down from her position as Associate Provost and an equally good friend of Public. Indeed, 2014 was a year of leadership change at SU. I have observed what happens when one chancellor leaves an institution and another comes in. Priorities change; programs and people rise and fall. What was praised one day becomes a little dangerous to do the next, and what was marginalized before is now prioritized. This phenomenon is characteristic not only of higher education as a system; we see it in the political sphere, and in much of organizational culture. Do I conclude that academia is inescapably top-down? No. Rather, I am more convinced of the efficacy of culture change over top-down decrees to make certain practices possible under any leader. Culture change requires long, slow work, emanating from multiple points in an organization’s hierarchy; by finding who shares particular values, philosophies, and pedagogies and is trying to operationalize them through their respective positions. That is, those who seek to raise up particular values and practices do well to carefully collaborate with people at all levels of the hierarchy—students, staff, administrators, tenured and non-tenured faculty, chairs, deans, and colleagues at “peer” institutions—who are open to furthering such a vision through their actions. “Man is an animal suspended in webs of significance he himself has spun,” wrote anthropologist Clifford Geertz (1973, 5), and that web is a cultural ecosystem, not so easily dismantled. The slow work of building a web of like-minded approaches to teaching, scholarship, and the elusive idea of “the public good”—all core to a university’s purpose—animates a vision capable of living on after any leader comes or goes. The levels of support such initiatives garner will ebb and flow, but if built into how an institution, on multiple levels, does its work, it is complicated indeed to undo entirely. The current issue of Public, Organizing. Culture. Change., echoes the theme of Imagining America’s 2014 national conference in Atlanta. The contents are evidence of people working at all different points in their respective institutions for changes that reflect greater equity and participation in public life. The issue begins with the conference keynote by Doug Shipman, CEO of Atlanta’s Center for Civil and Human Rights, on the role of story in advancing civil rights. Next is a response by a cohort of graduate students, all Imagining America Publicly Active Graduate Education (PAGE) fellows, who foreground the ideas of collective memory and engaged storytelling in their own diverse efforts in performance studies, English literature and composition, history, American studies, visual studies, ethnic studies, and religious ministry. Furthering themes from the opening plenary of the conference, Erica Kohl-Arenas of The New School, Harry Boyte of Augsburg College and Public Achievement, and Carlton Turner of the community-based arts network Alternate ROOTS discuss discuss democracy and education, change from within, and change from without, also looking at possible collaboration between communities and higher education towards progressive ends. Then Maria Avila, Kevin Bott, and Vialla Hartfield-Mendez describe weaving together organizing, the arts, and university culture in order to plan the 2014 conference, itself meant to catalyze further organizing in higher education. The contributions that follow foreground the roles of the arts, design, and humanities in making higher education more equitable and accessible. In “Towarrds a Social Practice,” Marion Wilson describes the trajectory of her art practice and its development into a socially engaged curriculum at Syracuse University. She then discusses the notions of neighboring, art, and social change with Rick Lowe, recipient of a 2014 McArthur Fellowship. A series of case studies that share organizing, culture, and change as keystones follow. In “Public Life through a Prison/University Partnership,” David Coogan writes about bringing his college writing students into local jails for cultural inquiries across the physical and ideological barriers that keep such constituencies apart. Joan Jeffri’s “ART CART: Saving the Legacy” is about a multi-university, intergenerational project that connects aging professional artists with teams of advanced students in order to undertake the preservation of the artists’ creative work. In “Lost Stories and Cultural Patrimony,” UC-Berkeley instructor Patricia Steenland considers what makes her and her students’ partnership with Owens Valley Paiute tribal elder and water activist Harry Williams successful. In “Citizen Stories: A New Path to Culture Change,” Alex Olsen, Elizabeth Gish, and Terry Shoemaker interrogate their curricular approach to culture change within a civic engagement framework, through a deceptively simple two-part assignment. In “ReImagine A Lot,” Claudia Paraschiv recounts engaging residents in Salem, Massachusetts, to imagine what a local abandoned lot could be. Lastly, Ben Fink reviews Democracy’s Education, a compilation of new essays about public work in higher education, edited by Harry C. Boyte. This issue will explore underlying assumptions and politics that challenge how arts and design practice can produce knowledge. How have the arts and design illuminated both teaching and learning, and led to greater understanding and insight? In demonstrating instances of the arts and design as pathways to new ideas and revelations, we challenge the notion that creative practice is supplementary to producing knowledge. This issue will also honor our late, beloved colleague, Randy Martin, member of Imagining America’s National Advisory Board and a great friend of Public. We welcome pieces of any length that evoke, recognize, and honor his work, particularly as he broke barriers between the arts and scholarship. How do we develop the critical capacity to recognize and value tools and techniques of the arts and design that serve multiple, cross-disciplinary purposes and produce new ideas and understandings? How do representational forms—visual: 2-D, 3-D, and new media (image/spatial/virtual/ real-time/online); oral and time-based practices (audio, performance, documentaries, etc. )—communicate across disciplines, in classrooms, studios, scholarly convenings, and communities? What do the arts and design contribute to, or how do they collaborate with, disciplines that are assumed to be scholarly? How are or could arts and design practices be assessed and assigned value as research/scholarship? This issue will be co-edited by Aimee Cox, Kim Yasuda, and Jan Cohen-Cruz. We welcome the following formats, linked to the theme of the issue: Principles and Practices (critical pieces in one or multiple media, single or collaboratively authored, narrative or interview format); Case Studies and Resources (innovative research methods, syllabi, assignments, etc., at any level); and Reviews (relevant books and cultural events). Submissions will be accepted from July 15–August 1, 2015. For more information visit http://public.imaginingamerica.org/about. Public: A Journal of Imagining America is a peer-reviewed, multimedia e-journal focused on humanities, arts, and design in public life. It aspires to connect what we can imagine with what we can do. We are interested in projects, pedagogies, resources, and ideas that reflect rich engagements among diverse participants, organizations, disciplines, and sectors. Public is part of the national consortium Imagining America: Artists and Scholars in Public Life, committed to the intersection of culture and participatory democracy, and is aligned with its Vision, Mission, Values, and Goals. 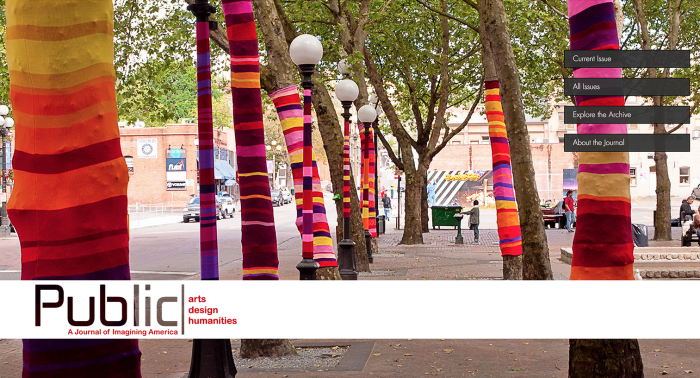 Knitted Trees”: an art installation by Suzanne Tidwell in Seattle, Washington. 2011.